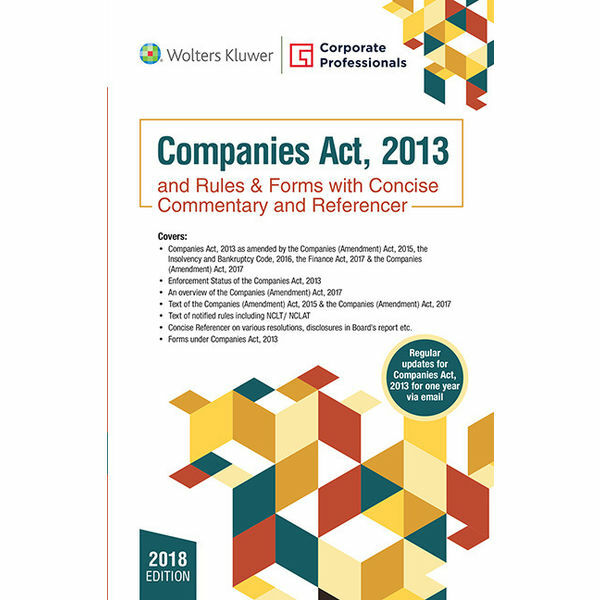 Companies Act, 2013 and Rules & Forms is a best seller from the house of Corporate Professionals, which has emerged as a leader in bringing out up-to-date books on the Companies Act, 2013 with more than 50,000 copies sold till date. The book is widely recognised for its easy reference to relevant rules and forms alongside each section. While maintaining its credibility from the last five editions, the scope of the sixth edition has been expanded by extensively covering the amendments carried out by the Companies (Amendment) Act, 2017. It also incorporates section wise legislative clause and useful ready referencers. Sections of the Companies Act, 1956 vis-à-vis sections of the Companies Act, 2013 & vice-versa. Concise Referencer on various resolutions, disclosures in Board’s report etc. Send an e-mail on info@companiesact.inwith your Full name, Organization name, contact details and e-mail id for getting regular updates on the Companies Act, 2013 for next one year.